A hot weekend, but another round of below normal temps is moving in! The well below normal temperatures we've experienced for much of the month has resulted in this weekend's "normal" July weather feeling rather uncomfortable. Seems to be pretty easy to acclimate to cooler weather and take for granted the lack of 90 degree days. Then when a couple of days, such as this weekend, send the mercury into the mid 90s with heat indices very near Heat Advisory criteria, we realize just how fortunate we have been! High pressure ridging into the area at the surface and aloft has resulted in a significant rise in the humidity levels and above normal high temperatures today, which will continue tomorrow. Be sure to take your Memphis summer heat safety precautions again tomorrow! However, the ridge retreats as yet another cold front pushes through, pushed to the Gulf coast by another building upper-level trough over the eastern U.S. This trough will bring below normal temperatures back into the Mid-South for the last week of summer vacation for many youngsters. Though not as cool as the last round, highs in the 80s, lows in the 60s, and dewpoints below average will once again bring a taste of early fall to the area. The mid-level weather map (18,000') on Tuesday evening features a large trough over the eastern U.S. and huge ridge over the west. This has been the dominant pattern in July, which is very unusual for mid-summer and results in cooler than normal weather under the trough. The cold front will move through Sunday night, but since most of the dynamics and cooler air aloft stay just to our north, a widespread severe weather outbreak will not occur. In fact, despite the low level moisture ahead of the front, the chances for rain are even fairly slim and confined to the evening hours on Sunday. Because the front will be pushing into a hot and humid airmass though, any storms that do form could bring strong wind gusts and brief heavy rain will also be a threat, in addition to lightning, Sunday evening. The best chances of severe weather will remain well to our north and east, especially in the upper Ohio River Valley where significant severe weather is possible. Here's our complete MWN Forecast for the upcoming week. 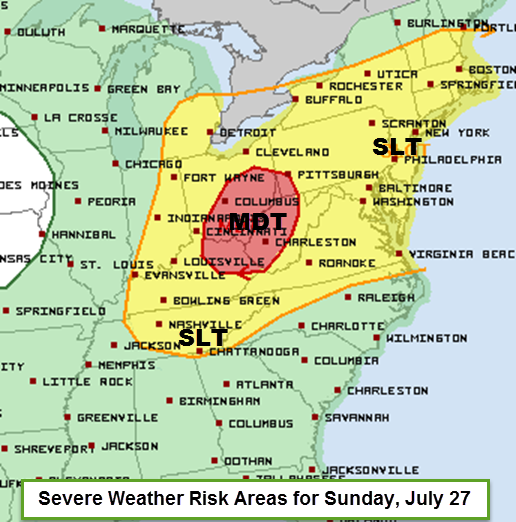 Severe weather will be likely in the Upper Ohio Valley, but is unlikely in the Memphis metro, outside of a stray thunderstorm with gusty wind and dangerous lightning. Temperature outlook for August 3-9 indicating a high probability of below normal temps in the dark blue shaded areas. Another cold front, then another BIGGER cold front! It's rare to talk about cold fronts in July as much as we have been this month. All these fronts, Canadian air intrusions, and upper-level lows have contributed to a month that is averaging over 5 degrees below normal and the third coolest July in Memphis recorded history through yesterday. Well, we have a couple more fronts that will contribute to what will very likely end up keeping temps well below normal for the month by the time it ends. 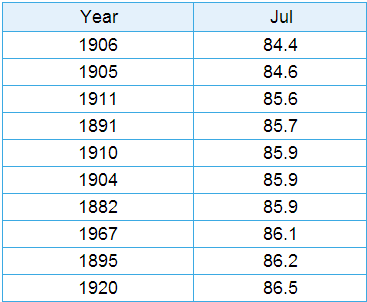 Top 10 Coolest Julys in Memphis since 1875 (2014 through July 21) by average monthly temp. A "typical" July front (if they make it this far south) is one that sinks into the area and weakens, then washes out with little effect other than perhaps a wind shift. The first front in our 7-day forecast arrives Wednesday night and is a little stronger than typical, but not like what we saw last week. It'll bring a chance of thunderstorms Wednesday and Wednesday night, then shift wind to the north and drop dewpoints (a measure of humidity) back down to near 60 briefly. Temps will also fall back into the mid 80s on Thursday. However, like a typical post-frontal airmass in July, it won't last long. Heat and humidity build heading into the weekend. Location of surface fronts on Wednesday evening, along with where rain chances are expected via the NWS. The front will turn around and move back north by Friday. By late in the weekend into Monday, we'll see scattered storms popping back up over the area as another front moves closer. Looking at the airmass pushing in behind this front, it looks like well below normal temperatures are again expected for a good part of next week. We're not forecasting anything like the records we had last week at this point, but those who could live without Memphis heat and humidity will likely get yet another multi-day period of relief. Can one even call it relief when it's been the norm this summer it seems?? Temperature outlook for July 27-31, indicating a high likelihood of below normal temps for a large portion of the eastern U.S. due to a significant upper-level trough expected to dominate the weather pattern. On a separate note, today is the 11 year anniversary of the derecho (long-lived wind storm) that swept through the city on July 22, 2003 (dubbed "Hurricane Elvis"). Read our retrospective written last year for the 10-year anniversary here. Cool July weather sets records - the month "by the numbers"
Besides perhaps pool owners who can't seem to get their pools to warm up, there are very few complaints about the unusually cool July we're experiencing in the Mid-South, particularly this past week. For perspective, we thought we'd break down some of those numbers for you. All data is for Memphis International Airport, the official station for Memphis and temperature records extend back to 1875, or 140 years ago. Through July 19th, the average July temperature has been 77.7 degrees. 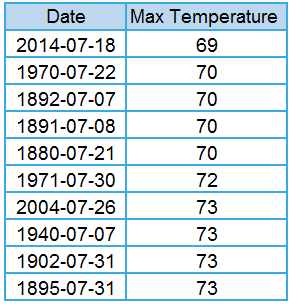 If July ended today, it would tie for 4th coolest July on record. Top 10 Coolest Julys based on daily average temperatures for the month. Records date to 1875. Through July 19th, the average high temperature for July has been 85.9 degrees. If July ended today,this would tie for 5th coolest average high temperature. 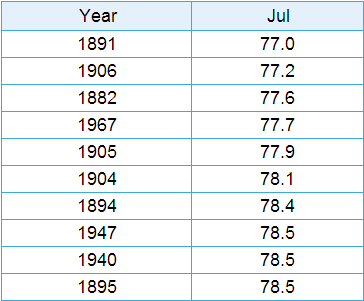 Top 10 Coolest Julys based on daily maximum temperatures for the month. Records date to 1875. 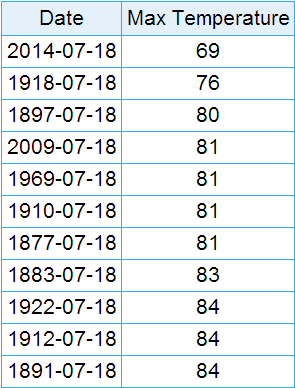 Two days have set records for coolest high temperature (minimum maximum temp) on their respective days: July 18 (69 degrees, previous mark was 76 set in 1918) and July 19 (79 degrees, previous mark was 81 degrees set in 1877). Top 10 (plus ties) coolest high temps for July 18th. Records date to 1875. The 69 degree high on July 18 also set the monthly record for coolest July high temperature (for the entire month), beating the previous low water mark of 70 set multiple times. The 69 degree high on July 18 was also then the first time in 140 years of record-keeping that a July day had NOT reached at least 70. The previous mark for earliest sub-70 degree day after July 1 was August 23. In other words, after July 1, the earliest Memphis had ever NOT reached 70 was on August 23 - we beat that mark by over a month. The five-day cool stretch from July 15-19, 2014 had an average daily temperature of 71.4 degrees, which ties for the 10th coolest five-day July stretch on record and the coldest such July stretch in 42 years. So anyone that is 41 or younger and lived in Memphis their entire life has not seen a stretch of July this cool in their lifetime. So what is causing this abnormally cool pattern? Some tried to blame a summertime Polar Vortex for the cool weather across the eastern U.S. early in the week. Actually it was a dip in the jet stream of significant proportions that is expected more in the cool season than summer and which we described more fully in a previous post. 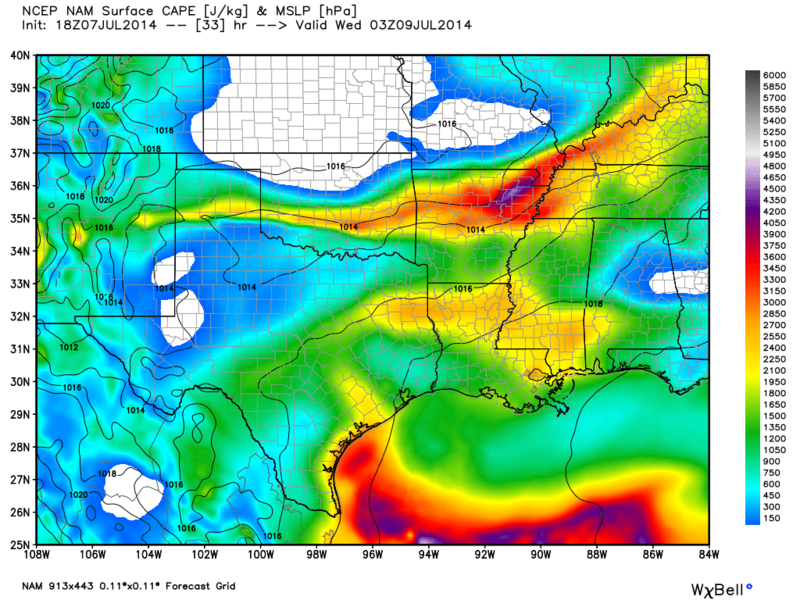 However, this upper level trough forced a strong cold front all the way to the Gulf Coast. That was followed by a low pressure system that slowly crossed the area the past couple of days, bringing clouds and rain Friday and leftover moisture resulting in continued cloud cover today. 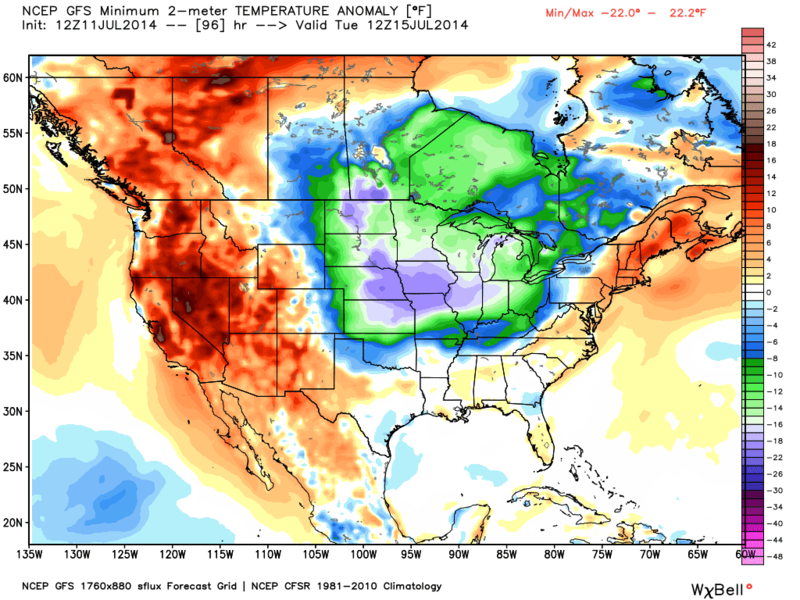 All of this is fairly unusual for summertime but more expected in the cool season. So where do we go from here? Upper-level ridging (high pressure) builds back in over the next few days, causing clouds to break up a bit more tomorrow (resulting in temps into the mid 80s), then more seasonal summer conditions for the first half of this week with highs closer to 90+. Another cold front approaches on Thursday, but looks to wash out over the area (as more typical of summer), then July heat continues into next weekend. 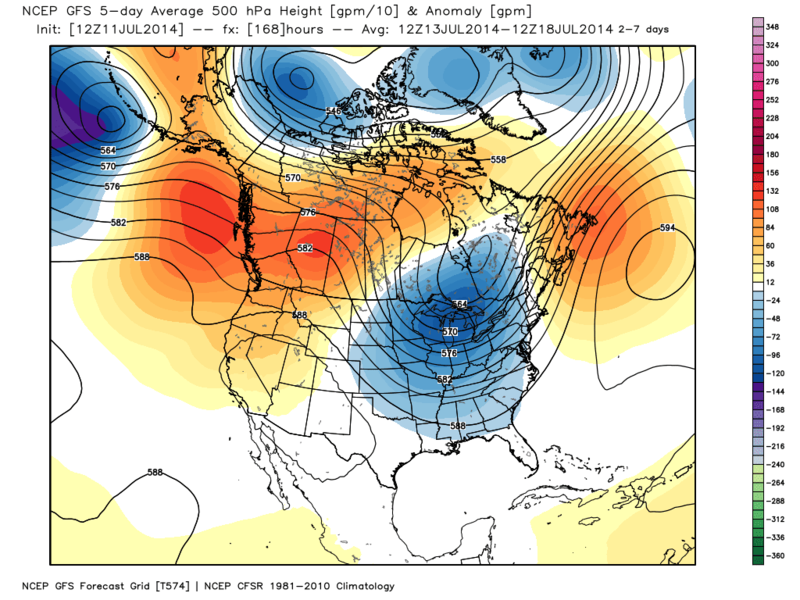 Another more significant trough could affect the area in the 7-10 day timeframe to end the month, but that's a ways out. Hopefully your took advantage of the cool weather and are ready for summer to return! Don't count on another stretch like this week for many years! Severe thunderstorms rolled through the Memphis metro on Monday late afternoon and evening ahead of a strong cold front of Canadian origin. A pre-frontal trough plowed into a very unstable airmass featuring temperatures in the mid 90s, high dewpoints, and high total atmospheric moisture that contributed to torrential rain in some storms, even though it generally didn't last very long. One result of the early storms that formed in the late afternoon heat were strong downbursts of wind, called microbursts, that resulted in straight-line wind damage in some areas, including trees and branches down and even some power infrastructure damage. Microbursts, or downbursts, occur when a mature thunderstorm collapses (part of the normal life cycle of a storm). When this happens, the air that is forced up in thunderstorms (updrafts) quickly falls to the ground, hits the earth, and spreads out in all directions, like ripples in a pond spreading out when a rock is tossed in. Microbursts have been known to produce a great deal of damage due to wind exceeding 100 mph! The wind that spreads out creates outflow boundaries, or gust fronts. Often if the wind is strong enough (58 mph or higher), a Severe Thunderstorm Warning will be issued for these phenomena and it's best to seek shelter when the tell-tale outflow boundary, or shelf cloud, is approaching! 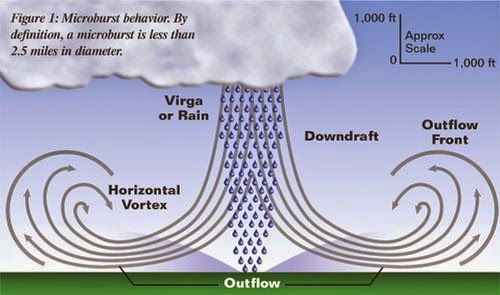 Schematic of a micrburst, in which a thunderstorm downdraft hits the ground and the wind spreads out in all directions. It is important to know that Doppler radar only senses wind moving towards or away from the radar, not side to side. So while the wind near the surface spreads out in all directions when a microburst occurs, the radar only "sees" the components of the wind moving along the radar beam - towards or away from the radar. Two radar images from late Monday afternoon show the microbursts as they were occurring. 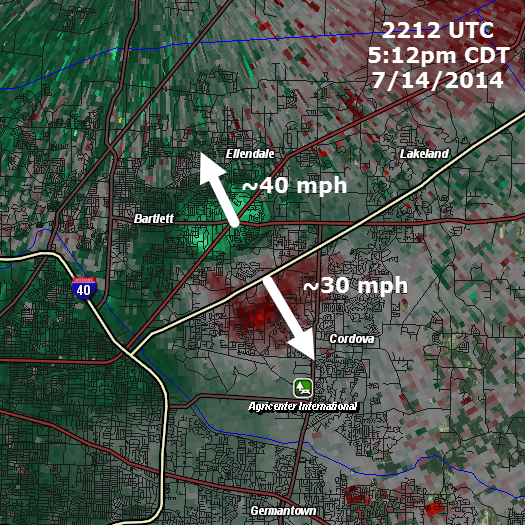 The first image below shows the Doppler data (wind direction and speed) for a microburst between Germantown and Collierville. The NEXRAD is northwest (up and left) of this location, so the green colors are showing wind blowing towards the radar and the red colors are showing wind blowing away from the radar. In between is where the downdraft wind hit the ground, then spread out. 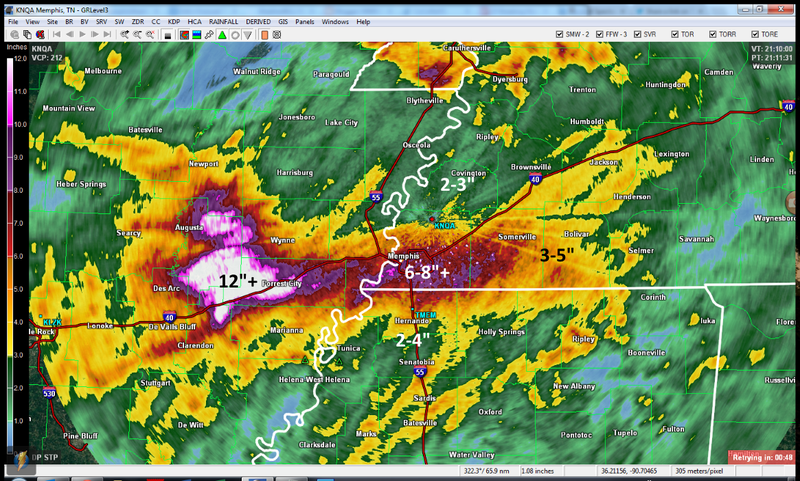 Doppler estimates are about 45 mph in the green area and 35 mph in the red area. Therefore, the wind that was collapsing down from the thunderstorm was traveling much faster than either of those values, resulting in the most damage directly under the microburst. 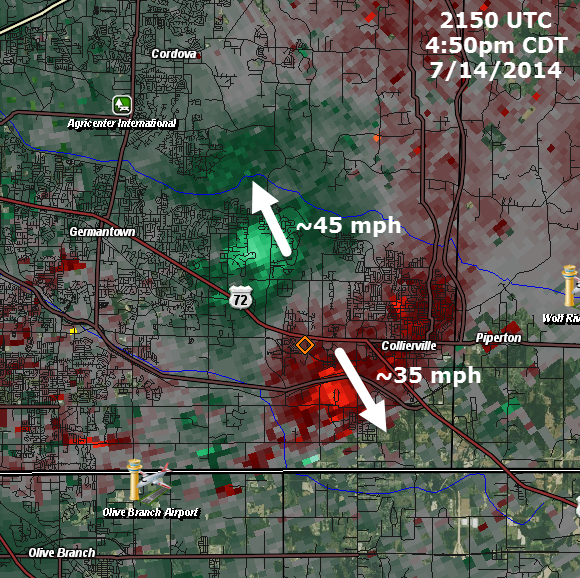 Doppler velocity data indicates the presence of a microburst near Collierville on July 14 with strong NW wind over Collierville and stronger SE wind on the east side of Germantown. The second microburst image came from the Bartlett area about 20 minutes later. Once again, the NEXRAD is northwest (up and left) of this location, so the green colors are showing wind blowing towards the radar and the red colors are showing wind blowing away from the radar. This microburst (at least at this time) was not as strong as the Collierville one, but nevertheless produced very gusty wind over the east side of Bartlett in particular. Doppler velocity data indicates another microburst near I-40 and Sycamore View with strong southeast wind over Bartlett and NW wind heading into Cordova. When microbursts hit the ground, wind can seemingly come from all directions or "swirl" as the air moves chaotically in that localized area. Some people report this swirling wind as a tornado, but the microburst is a very different wind phenomena from a tornado. Typically, those surveying storm damage will see a wind pattern that spreads out from a central point in the case of microbursts, which make it fairly obvious that a straight-line wind event occurred, rather than a tornado. Your tree or the power pole really doesn't care what hit it when it's laying on the ground though! It just knows it got hit by a wind it couldn't stand up to! Do you have any questions about microbursts or other wind phenomena? Leave them in the comments and we'll be sure to answer them! High pressure aloft and at the surface this weekend will mean hot temperatures with increasing humidity, leading to what could be the hottest day of the year so far on Sunday. With minimal rain chances and light wind, high temps will reach the mid 90s Saturday and Sunday, and perhaps Monday as well. Sunday has the best chance of being the hottest day - we have a forecast high of 96 with heat indices approaching the danger level (which is 105). Heat safety tips will be important this weekend and sunscreen will be a must if you spend any time outdoors. That all changes next week as a system some are erroneously labelling the second coming of the Polar Vortex drops south out of Canada into the eastern U.S. We won't get into technicalities of the name of it (we firmly believe this is not a polar vortex though) [Read more: "Poor Man's Polar Vortex", "NWS Walks Away from Polar Vortex Claim," and "Cold Snap II: Revenge of the Polar Vortex?"]. However, the massive - and rare for climatologically the hottest part of the year - upper-level trough will be more welcome this time around than when the first "polar vortex" showed up in January with bitterly cold temperatures. 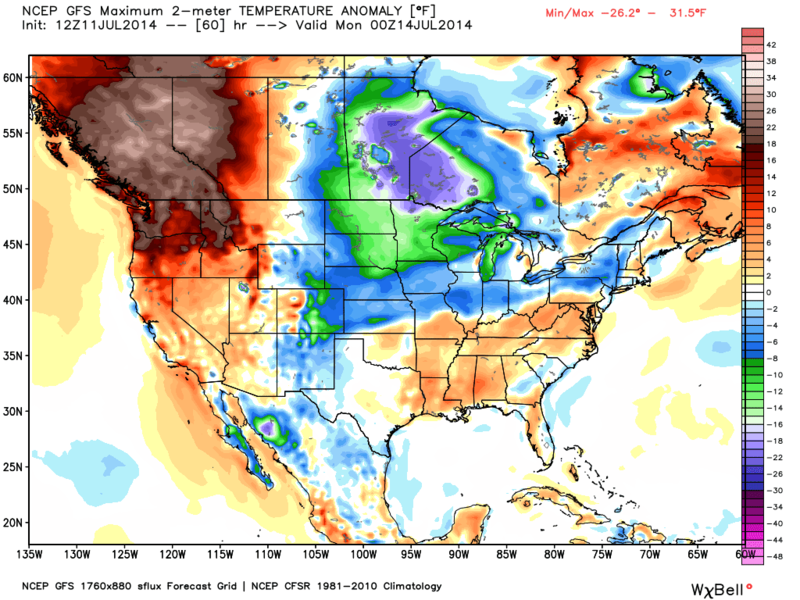 and "Well below normal temperatures in July are simply dubbed "pleasant!" Graphics from the GFS computer model (which are backed up by previous runs of the model and other medium-range models not shown) are below, but suffice it to say, record lows near 60 and record low maximums in the mid 70s are not completely out of the realm of possibility! Yes, in JULY! Note that all graphics are from a particular model solution and do not represent FORECAST conditions, but one possibility that is bolstered by multiple runs of the GFS model, as well as other medium-range model output. The transition from hot to well below normal will be marked by a strong cold front that is expected to bring thunderstorms. Anytime this drastic of a change is in the cards, we have to keep our eyes open to the potential of severe weather. The time to watch appears to be late Monday into early Tuesday. We'll keep you posted. In the meantime, get some swimming in this weekend and stay cool and hydrated, then get ready for a welcome sign of early fall by mid-week! Here's our latest forecast. 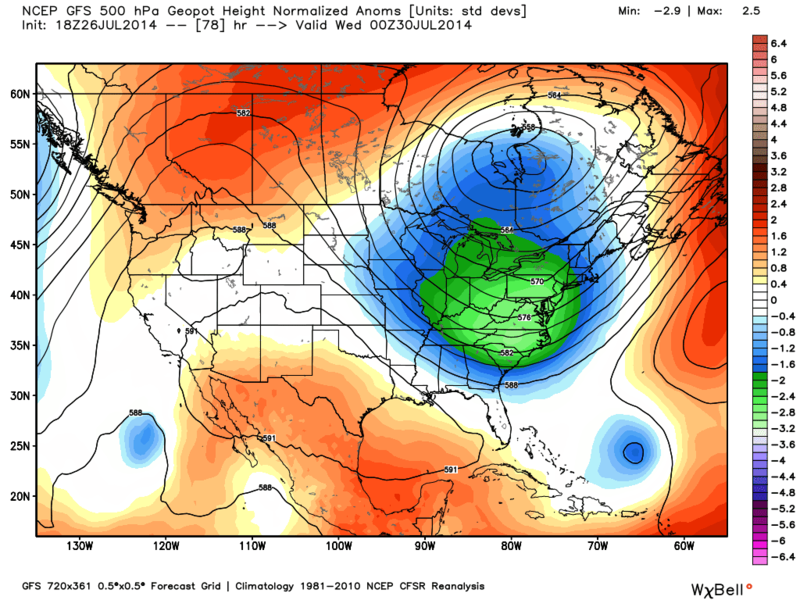 Average 500mb (18,000') pressure pattern from Sunday-Friday with anomalies (departures from normal) in color shading. The entire U.S. east of the Rockies has anomalously low pressure as a massive trough (dips in the black lines, or isobars) sits overhead. Troughs typically bring below normal temps, while ridges, like the one over the western U.S., bring above normal temps. 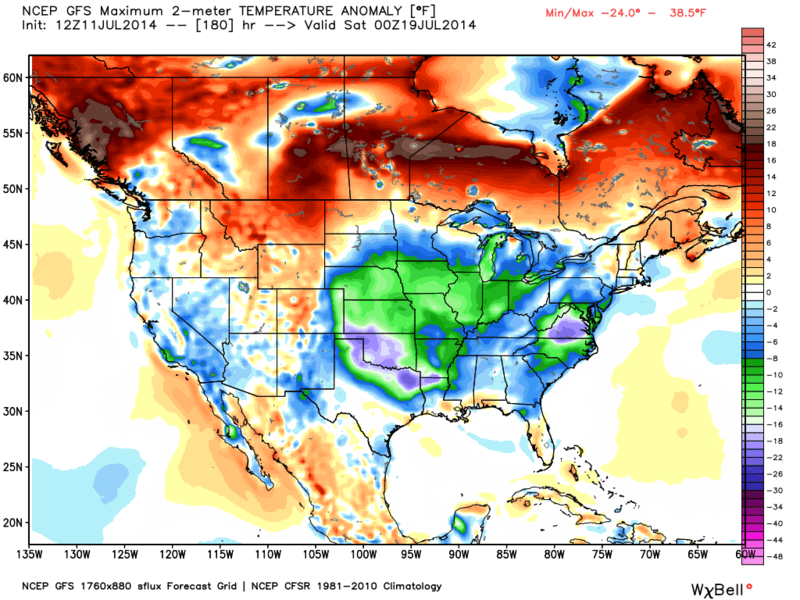 All following graphics show "departure from normal (DFN)" temperatures from the Friday morning GFS model. 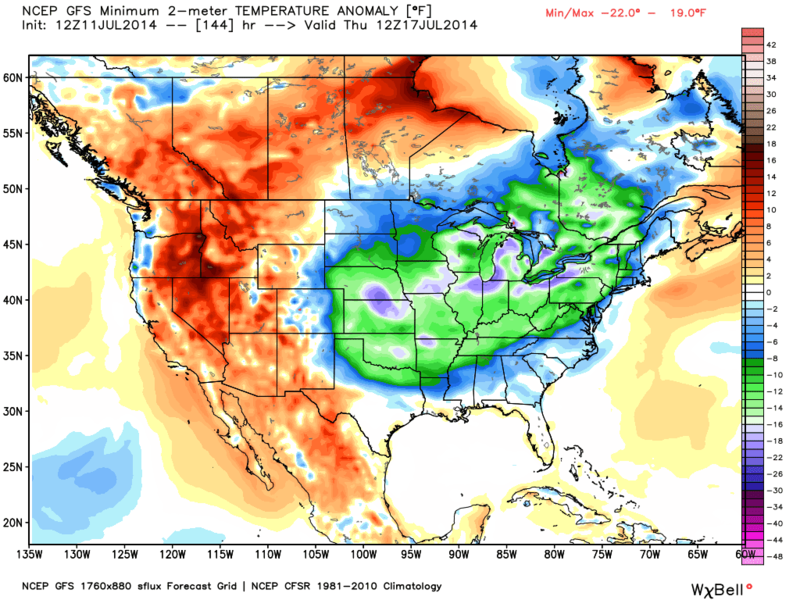 This one shows the cold air, represented by Sunday afternoon DFN high temps, from Canada south to the Ohio River. DFN high temps for Wednesday as the broad upper-level trough settles over the eastern U.S. 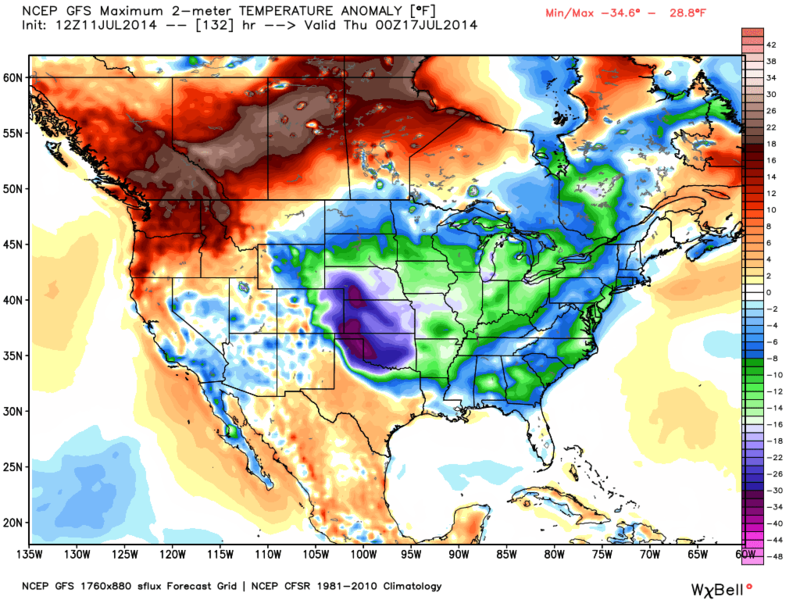 Note the 30-degrees below normal temps over the Plains, while the metro is 10-15 degrees below normal. DFN high temps for Friday. The below normal temperatures stick around through the end of the week. DFN low temps for Tuesday morning. Lows from 15-20 degrees below normal are found in the Central Plains while the cooler air seeps south into the Mid-South. DFN low temps for Thursday morning. Lows in the metro of 10-15 degrees below normal (which is 74) could put us in record territory. Each month in 2014 has experienced below normal average temperatures. June continued the trend, but was just barely below average as May was. The average temperature for the month at Memphis International Airport was just 0.3 degrees below normal at 79.3 degrees. 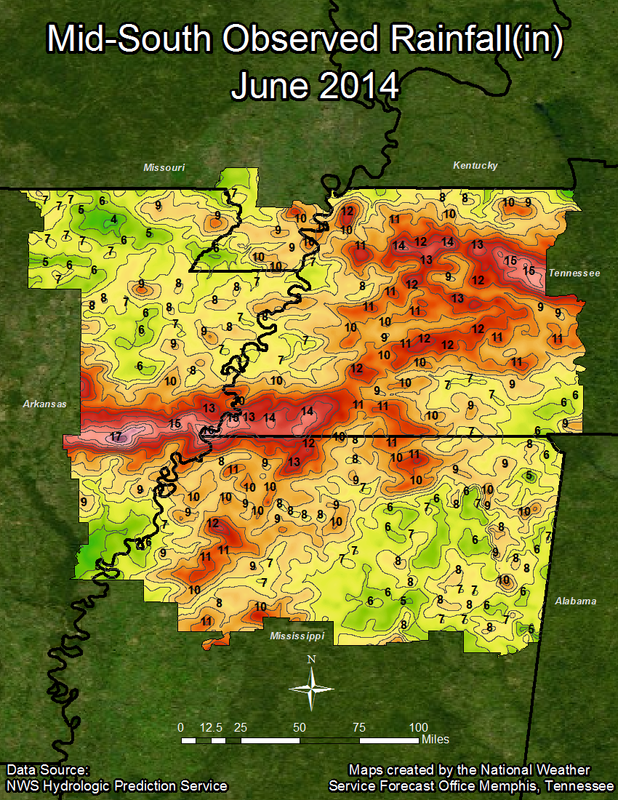 After failing to reach 90 degrees through May, Memphis reached 90 on ten occasions in June with a maximum temp of 94. For the first half of 2014, the average temperature in Memphis was 56.6 degrees, or 2.6 degrees below normal. However, the biggest story for the month was, by far, rainfall. 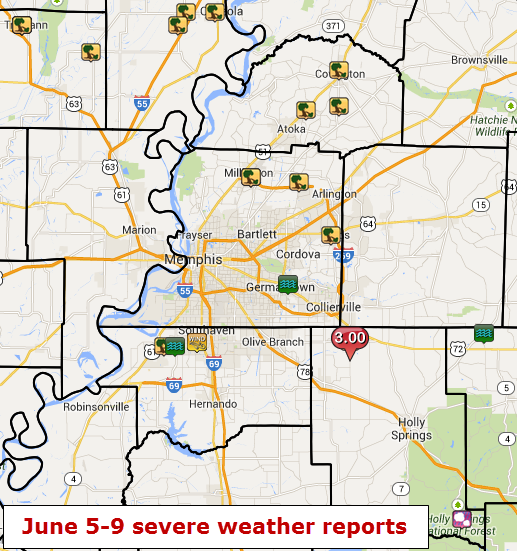 The early part of the month featured a few rounds of severe weather that produced sporadic wind damage reports and heavy rainfall with minor flooding (see top graphic below), but ended with a flash flooding event for the record books. The month ended up being the 8th wettest on record and 2nd wettest June, while the maximum 24-hour total from the 28th-29th (7.02") was nearly twice the normal average for the entire month! The daily record set on the 29th (5.87") was also the 7th wettest day in the Memphis record books. For the first half of the year, Memphis is nearly a foot above normal precipitation. Comments: Ten days had maximum temperatures at or above 90. For the year, the average temperature at Memphis is 56.6 degrees, which is 2.6 degrees below average. Comments: Five days had more than 1" of rain and six days recorded more than 0.50". At the halfway point of the year, the total precipitation has been 39.36", which is 11.45" above (or 141% of) average. The daily record precip on the 29th was also the 7th wettest day on record in Memphis and this month was the second wettest June and 8th wettest month on record. Comments: 12 days had high temperatures at or above 90. The coolest high temperature was 79.1 on the 10th. The warmest low temperature was 75.9 on the 30th. Comments: Three days with more than 1" of rain and eight days with more than 0.50". A welcome break from soggy conditions that pushed the month of June up to the 8th wettest month on record resulted in a well-timed Canadian high pressure system bringing cool air into the region for the July 4th holiday. More like early fall than the typical "dog days" of summer, we received no complaints on the conditions late last week that featured cool mornings, low humidity, and very pleasant evenings. As high pressure shifted east and southerly wind returned, so has the humidity and warmer temperatures the last couple of days. however, another cold front will move slowly through the region Wednesday, bringing elevated chances of showers and thunderstorms, and possibly some severe weather. The map below highlights the area where a Slight Risk of severe weather exists Tuesday afternoon and evening. Slight Risk of severe weather for the highlighted area Tuesday PM. With moisture increasing, the cold front approaching, and highs into the 90s on Tuesday, the atmosphere will set the table for strong to possibly severe storms across parts of the Mid-South. The greatest risk will be to our east, but thunderstorms expected Tuesday night could bring strong wind and heavy downpours to the area, besides the lightning threat that accompanies all thunderstorms. Hail and a tornado are a minimal secondary risk. The most likely time for strong storms in the metro will be during the evening hours up until around midnight. I expect, though, that thunder will be possible throughout the night into Wednesday as the front moves slowly through the region. 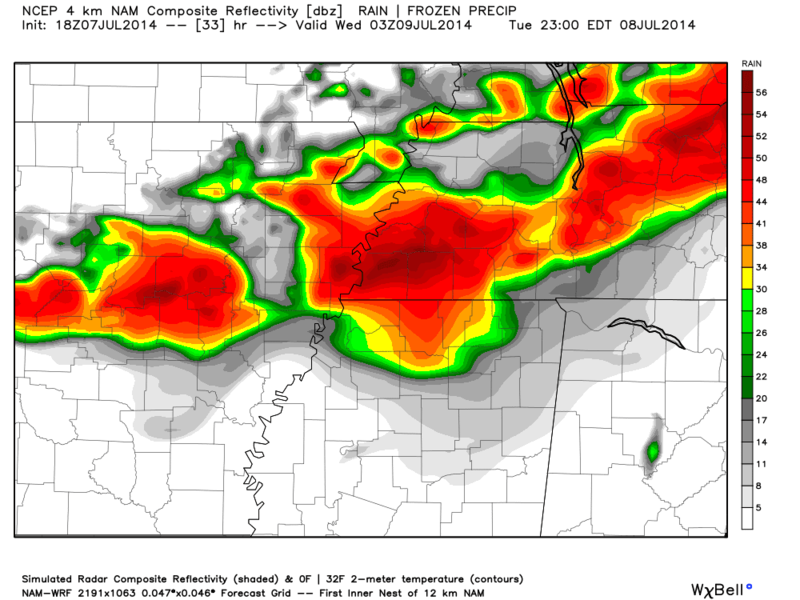 The NAM model depicts instability (or thunder-fuel) at 10pm Tuesday sufficient for strong to severe storms. By Wednesday evening, showers and thunderstorms are expected to be south of the metro in MS as the front weakens and washes out. Severe weather is not as big of a threat on Wednesday due to the earlier timing of the precipitation, which should hold temperatures down and keep instability values tempered. By Thursday, high pressure will build in from the north, resulting in slightly cooler temperatures and lower humidity (though not quite as glorious as late last week). High pressure will keep dry weather around into at least early in the weekend before shifting east and, once again, bringing hot and humid conditions back into the region. Another round of 90s (maybe mid 90s) with heat indices of 100+ is possible by early next week. Click here for the complete MWN Forecast, or find it anytime in our mobile apps (link below). We'll keep you updated on the thunderstorms trends via our social channels, also listed below.